Going to Heaven will take you to Hell as well. Society and religions have enhanced the perception of the “I” by offering to the world their teachings based on duality: Heaven with Hell, Sinner with Saint, God with Devil, Creation with Destruction, Body with Soul, Pure with Impure, Passing with Failing, Salvation with Damnation, etc. That was the beginning of insanity. The “I” becomes bigger and stronger when a “choice” is given to decide between the apparent opposites: If you want “Heaven” then, you must follow some rules, which will avoid Hell. As the concept of “Hell” became fearful, then the masses wanted an “authority figure” to determine what to DO, how to BEHAVE. A concept was sold and the solution was with the seller. Every single religion has teachings. Every single teaching as it stands today, has been grossly misinterpreted by followers who did not experience a change of consciousness similar to their founder, but rather; offered loyalty to their religion by DOING and BEHAVING the way their religion expected. As more people “join,” more laws are necessary. That “loyalty” offers continuity of teachings as static pieces of information, which are unable to change despite the changes in Life. That posture then becomes a dogma. Therefore, choosing one concept such as “God” implies the rejection of the opposite “Devil.” It is that rejection which will make up insane minds. Insanity will be proportional to the degree of obsessiveness to attain a concept such as God, Holy, Soul, etc. Many may have experiences with the spirit world, but the LABEL used to describe that experience is what creates the duality; in that duality lays rejection and with that the inability to change consciousness. We are stuck in that consciousness no matter what we DO or how we BEHAVE. Every religion believes to have the “truth,” but that is another concept to entertain ourselves, for it has the duality of falsehood. Observe that a “truth” it is only so, when it can be perceived due to a particular state of consciousness. God and Devil, Body and Soul, Pure and Impure, etc. are the SAME concepts, the same thing. What is the difference? Some believe that God is a person an entity, a soul, a spirit…The label “God” is what shapes their experience and creates a duality in their lives. The journey of a person is to experience all of those degrees in between the extremes for that is how consciousness will change naturally. For instance if you pick to go “south” rather than “north.” Eventually by going as far as we can go “south”… we will reach “north.” We could reject “north” all we want, but our obsession of reaching as far “south” as we can, will lead us into “north.” Nevertheless, “north” and “south” do not exist, they are merely concepts. Ahnanda speaks about these matters from his own experience. By having gone “north” and “south,” all there is to it, is to smile at such a “fun” trip that Life has offered. Spirituality is a deceitful word. Forget that word and you may find Life. By finding Life, you may start living it. By living it, enjoying it. By enjoying it, finding the meaning of spirituality. It is not a concept. To find honesty within ourselves, sooner or later we may learn to forget everything we have been taught, only to find who we ARE. Every experience in Life only will show us who we ARE at that moment in time. When we learn to accept ourselves as we ARE in an unconditional way, then we may be able to accept “others;” not as an idea, a concept, a “spiritual” virtue to practice, but as genuine, unrehearsed, unlearned, natural way of being. Want to work on being more loving? Do you have sainthood as an objective? Want to teach peace to others? Then your mind is engaged in the intellectual world of ideas, concepts and “spiritual” words. When the mind empties itself from the intellectual world, there is knowing in BEING. Does not make any sense? Wonderful! That is a step forward. Forget the “practice.” Forget to label virtues. Forget all dictionary words defining Love. Unlearn all of those concepts. “To surrender,” is not to give up something in Life. It is effortless openness when the “I” dilutes itself. “To love someone” is not just a mushy feeling. It is to allow that one to be, without conditions. To grow together in joy. “To be detached” is not to be insensitive, aloof. It is to acknowledge the process of another, knowing that we have our own. “To go with the flow” is not to follow what Life offers for there is no option to choose from. It is to BE one with Life. If you “practice” any of my “definitions,” you will deceive yourself. If you repeat any of my definitions, you will not be honest with your own findings. Know that your own definitions will need to change in time, just like mine. That is what we have in common. Change. It is said that to know “Spirituality” there is a need of a teacher to teach. I am assuring you that none of the “spiritual values” can be taught. It can only be found in your own walking path. As you place one foot in front of another in your Life journey, you will recognize the teaching that Life offers, only because you already know it. Concepts can be taught, not Living Life. To teach “spirituality” is deceitful. We can only share our experiences as a friend shares with another. When that one is ready, your words can only inspire, allow for a different perspective, but words are not meant to teach in the realm of Life. Life is the teacher, without being appointed for that. Since we could observe that any perspective that we take towards Life has a consequence, and that any perspective is neither “right” nor “wrong,” then we could be open to acknowledge every perspective. Moreover, if we support a particular view of Life we will be closed, biased towards the others. What is the practical aspect of the above? Robert gave some chocolates to Mary. Observe how the feelings in Mary and Robert will change towards each other. It will be another “brick on the wall,” in the way their perception of the “outside” will be perceived. That animosity created through misunderstandings, interpretations and even by unconsciously poking into someone’s hurtful triggers, collaborates into the feeling of heaviness, darkness which will color our perception of the world. “The world is THIS and I am THAT.” An absolute response to the World, ready to turn into a dogmatic way of living. The point is to realize that “I am interpreting,” thus what comes out of my mouth or anyone’s without exception, is not the holy truth; but merely a perception. That is known as the benefit of the doubt. That perspective of giving someone the benefit of the doubt in healing in itself. Because we are trusting Life. The way to stop the heaviness of that energy of suspicion and self-righteousness is by giving the benefit of the doubt. In this way we could understand that to “have doubts” is not “bad,” it is not only a sign of insecurity or lack of faith, but its utility resides in using that energy with wisdom, according to time and circumstances. All opposite energies have the same source. Different polarities is what we perceive. Lost in the perception that “I am right,” we do not realize that “I am wrong” is part of the same energy. To experience one side, means to experience the other. Question: How does change happens without “making it” happen? You have mentioned that just observe yourself without intention to change it and change will happen.I am confused how change will happen if we don’t think about changing it. For ex if I have anger and i just observe myself and don’t try or even intend to change anger to calmness or peace, how can this change in consciousness happens on its own. Thank you for your question for the common good. Did we observe that consciousness changes all by itself? Believing in Santa Claus was a stage of consciousness, which changed into not believing in him. Were you upset when that change happened? Did you feel that someone lied to you? We can apply the above example to all the beliefs that we have acquired. Life is change, we are Life itself, thus we will change. It is obvious. There is no moment when “we” are the same, “we” are always changing, evolving, except when we hold onto beliefs of being a static self. We make it a dogma. Are you the same as 10 years ago? Are you the same as a month ago? Are you the same as a day ago? Not a chance. Matter of fact. Do you see that? All we can change is behavior, but not our inner feelings. It was shared before, that there is no energy “inside” us, which is “good or bad.” Those are just labels that we have given in our dualistic consciousness. Have you seen a game of ice hockey? Is to play hockey “bad”? Anger is the energy used to play most sports. It is a re-directed energy. Are sports “bad”? Sports are channels to redirect anger. If you are completely AWARE when anger happens, it is that realization how anger could go away. I am saying, “it could go away” for perhaps to experience suffering as the consequence of acting in anger will be needed. That experience will teach us for sure. The same as when someone discovers of having a disease because of anger. NO. If we are AWARE. Have you noticed how the natural anger of youth goes away all by itself as we get older? What have you done to make it happen? How are you going to learn about the energies inside you if you don’t observe it? 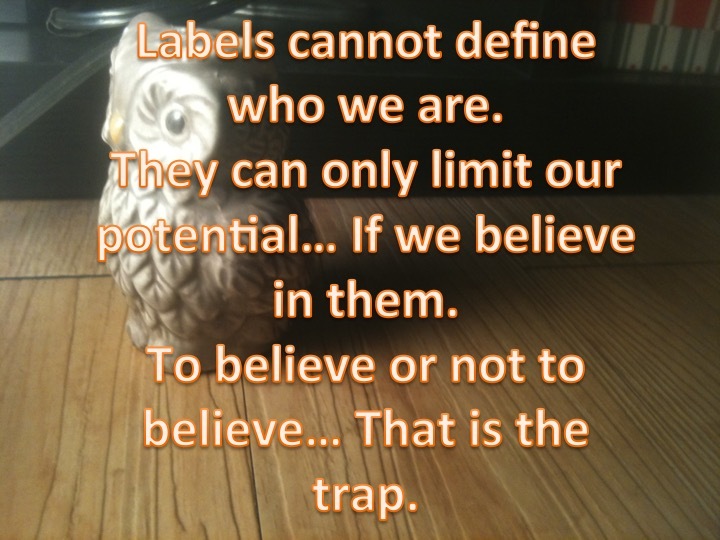 Do we think that by labeling something as “bad” and to repress that will be the solution? Life is about experiencing to know. To be AWARE and not to “know theoretical knowledge” is how we assimilate Life, that brings change in consciousness not some human or “divine” method. Experiencing means to BE. When you ARE you know. Experiences in Life have a range. We go from believing in Santa Claus to not believing in Santa in one Lifetime or in many. There is no goal, nothing to attain. It goes from one side of the range of experiences to the other side and then vice versa. There is a moment when we are full of “I.” There will be a moment when we are not. It just happens. Appreciate that for it will change. As our “I” diminishes, we have no issue in understanding the above. As our “I” increases its size, we cannot understand the above, for we think that we “have to do something” to make a change. To have a “big I” is not “bad,” but just a state of consciousness which will change all by itself through the assimilation of Life experiences. Suffering will be experienced for sure, but that is not “bad” either, but just a means to change. To have a “small I” is not “bad” but just a state of consciousness which will change all by itself through Life experiences. As we evolve, so our “I” will grow in pleasure, until it needs to decrease its size, that is when suffering comes in. Do we see the pattern? Just like the 4 seasons. One goes after the other automatically, uncalled for. All of the above are merely experiences. Nothing to reject, nothing to avoid. It is about Balance. Harmony. Balance is not something that we could learn in a “spiritual class” but something that we become attuned to it as we live life in AWARENESS. Balance does not reject, does not have the aim to become “better or worse,” it is a state when our feelings, our thoughts and our actions are heading in the same direction, without purposely trying to make it happen. Observe. Become AWARE that is all. Do not judge, label or add moral values to it. OBSERVE, become aware. If you “do” that without “doing” it , but when it just happens naturally, you will not be confused. You will know. The greatest opportunity that Life offers is right now. There is no other timing for the one who is aware of impermanence, change, newness and therefore, appreciation. Can we live with that? Can we embrace that total “flowing with Life” rather than clinging to what we have been taught: security, control, certainty, safety, etc. That dichotomy of extremes has an abrupt and insurmountable space of mediocrity in between, but again is not about making a “decision” but to embrace it all. Nevertheless, we believe to be “good” if we do that every day or in “special” occasions. The above is a state of consciousness. It is known as submission. That submissive personality which is taught to believe in anyone else but themselves. A submissive personality thrives in suffering and in the hope of one day, to get out of it and to meet his savior. Thanking the Lord for “being here” is not the same as thanking someone for something that kindly, they have done for us. Thanking someone for “being here” is a contradiction when a belief is looking to “get out of here” to go to a “better place,” Paradise or Heaven. When we get up in the morning, do we appreciate the fact that we could move? Do we appreciate the fact that we could walk and use our senses to feel the world around us? No. We take that for granted. Just because for the most part, we could do it every day. When we are aware, that is an opportunity to appreciate “what is.” Not to thank anyone, but to appreciate the different flavors of Life. No. That is the importance of appreciation. We appreciate all of those changes. Ahh!..uhhh…ohhh…. ouch…man, it is hard to move!!! Let me complain a bit more… Dam it! I am getting old!!! Those “onomatopoeic effects” are just a learned behavior. But our consciousness is not set in appreciation but in comparison. To be trapped into the timeless, static “Me” is the issue. It is a mind problem not a bodily issue. As we become aware by observation of all the typical activities that we perform during the day, as we become conscious of the feeling behind those activities, we could observe how much appreciation is behind our day, and at the same time, how that appreciation goes hand in hand with enjoyment. Nothing wrong with praying or thanking … It is just a state of consciousness. Some kids think that they know everything when they learn to add and subtract. Thanks God… 🙂 Those kids do not have a problem in learning to multiply and divide. Every individual will have different experiences in Life. Experiences are not meant to be “interpreted” they are meant to be “experienced.” Out of the internal assimilation of those experiences, a new consciousness will emerge. Not through understanding of words. The word “judgment” is interpreted in many ways according to the person’s experience. “You know, that Carl is a bad person…” That judgment does not give the opportunity for Carl to change in our minds. Every single “reason” above is merely an interpretation of the word “Judgment.” Lost in thinking we could be open for many useless intellectual debates. Why useless? Because we are only lost in words and meanings of those words. We are lost in thinking …and thinking means automatic separation. NO. It will just give us a state of consciousness. Thinking is not “bad.” It has its place. If we want to enjoy Life and the different scenes, we may not want to use our “thinking” for that. We need to feel. Become intuitive. If already my consciousness perceives that separation as a “fact,” how is it possible to live together as One or to love each other as religions try to teach? In the consciousness of “I,” a higher moral figure is needed. A God. “I” am still an individual but at the same time, “I” can relate to the idea of brotherhood, because for most individuals that is part of their Life experience. “I” can interpret that experience in a Godly setting. God being the “father” means to obey him. The world is a family. “We are the world, we are the children.” How can I judge my brother? How can I judge my sister? God is the only one who can do that accurately. From that point on, every experience will be interpreted under that paradigm. In another consciousness, we could perceive that thinking has brought that separation. We could perceive that a single individual is a partial fact for that individual exists in relationship with everything else, just as a tree exists because there is sun and water and sky and air, etc. The thinking mind however, has made that separation of individuality. If we continue on with our inquiry, we may perceive that this “I” is part of everything there is, just like a drop of water is in the Ocean. The perception and awareness of being just the drop brings further separation from everything else. Perhaps at one point, we could perceive Oneness. Then, all the other concepts and words that separate items could be perceived as an illusion of language for that “new” consciousness, but yet understood as a “reality” for those still dwelling in thoughts and separation. 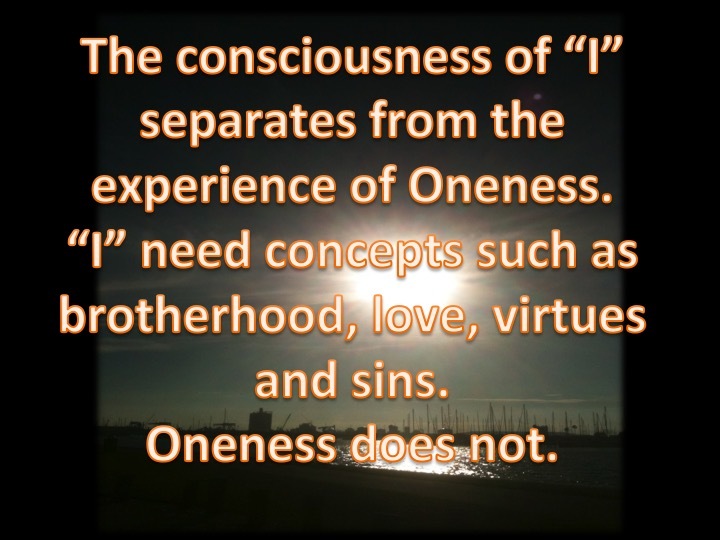 The “I” consciousness. In Oneness, there is no need to add the word God, to make the “I” separated from “him.” It is not a matter of a concept or a belief. In oneness we perceive oneness. The “movie of life” is one movie. We cannot separate from it. It is in that consciousness how the word “judgment” is meaningless. Am I judging myself in Oneness? Isn’t that schizophrenic? Therefore “moral values” such as “to judge is bad or good” are unnecessary. “I” am better. “We” are better. – Everyone is as they are. – Change is already built is this movie of Life. – Suffering is a great teacher. You may learn not to reject it. It is a sure way to change consciousness without using the “training wheels” of beliefs. The thing is not to “become better” (that is to compare) but through enjoyment of “what is,” through appreciation of “what is,” through being thankful of “what is” …. what could happen? Until March 16th. Enjoy, appreciate and be thankful! That is to be ONE with the common good. An atheist was invited by his friend to a wedding ceremony to be held at a church. The atheist entered and started looking at the decoration: Images of saints and Jesus crucified in a cross. The atheist was surprised by the atmosphere of peace that he felt in that wide room. All of the sudden, he saw a white light which almost blinded him but increased his peace and made him feel a special bliss that he has never felt before. The atheist was surprised after the experience and told his friend about it. His friend said: “That is God showing you that he exists.” The priest knew about that experience of the atheist and congratulated him profusely. It was a miracle. The atheist had experienced God by popular interpretation, therefore; he decided to convert himself into a Christian and from that point on, he strongly believed in God and followed his Godly book; the Bible. The above story may have happened to many of us. Through an extraordinary experience, we thought that God has “chosen us.” After all, not too many folks experience that type of experience. “I am special,” we thought. Notice how the interpretation of an experience resulted in the change of consciousness of the atheist. That which he denied, all of the sudden was completely embraced to the same extreme as his denial. What could have happened if that “special” experience was felt in a Muslim mosque? Or what about a Hindu temple? Obviously, “God” automatically would have acquired those colors. What is important to observe is not that the atheist have found God. Observe how his consciousness has changed into the opposite side. Observe how an interpretation has validated his beliefs. Eventually, that “experience” becomes the hook into becoming a believer. That change is very superficial. The former atheist may follow rituals, he may confess his sins and pray to God all he wants, but his consciousness will be stuck in that new location, for a dogma will be created in his mind. He found the “One.” The “One” who was denied. Unless this person allows for his consciousness to be open to further experiences, he will not be able to change anymore. However, in his heart there will be the longing of needing something else. Why? Is finding God or a belief in God not enough? No… unless he wants to believe it is. Once the belief is confronted and discovered, he may move into the next step. He will need to find himself. Being (labeling) an “atheist” or a “theist” is of no consequence unless we believe that to be the case. Lost into that duality, we could get “busy” by “doing things” such as proselytizing, supporting the faith, doing all rituals, etc. or going against it in a “hate” campaign. More duality…Same consciousness. The “special” experience is meant to be enjoyed. It is the point for a change. It is not meant to be interpreted.